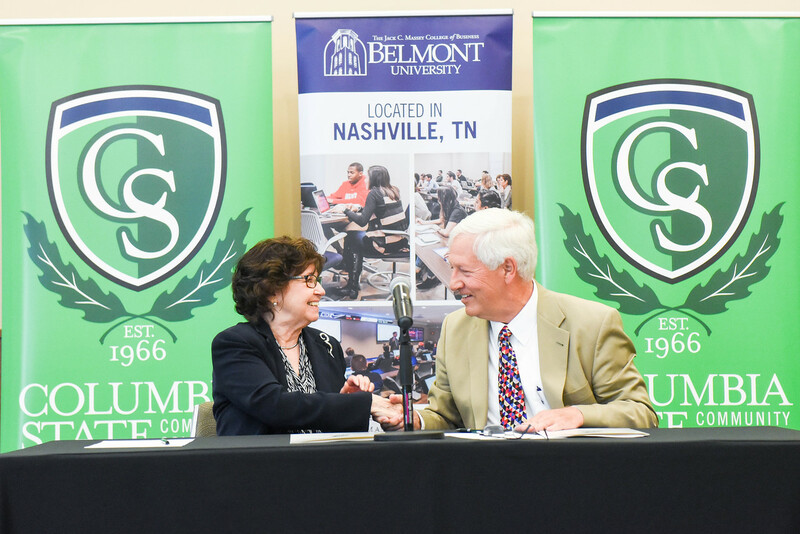 Columbia State President Dr. Janet Smith and Belmont University President Dr. Bob Fisher sign the articulation agreement. Belmont University and Columbia State Community College announced today a new partnership that allows Columbia State associate degree students the opportunity to earn a Bachelor’s of Business Administration (B.B.A.) degree from Belmont’s Jack C. Massey College of Business. According to a recent article in the Chronicle of Higher Education, 80 percent of students attending community colleges nationwide intend to pursue a bachelor’s degree, but only 14 percent have one six years later. This new agreement—which provides deeper connections between the two programs and streamlines services and admissions for students—aims to improve those numbers in Tennessee. Columbia State student Anna Pollard, who will be the first to transfer to Belmont under the new articulation agreement, speaks with Belmont President Dr. Bob Fisher. Eligible students must earn a Columbia State Associate Degree in Business Administration by completing the transfer coursework developed and approved by both institutions. Through this agreement, Columbia State students who meet stated requirements can be granted early admittance into Belmont’s Massey College of Business.